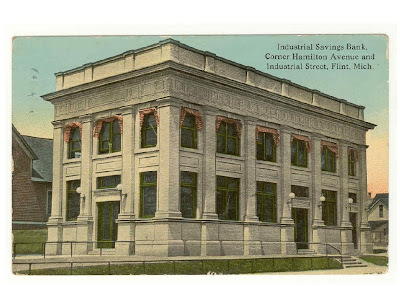 Gerry Godin, author of the All Things Buick blog, has come to the rescue again with more photos and information about the Industrial Bank pictured above, which was once located at the corner of Hamilton and Industrial. This was the second location of the bank; the first was in the nearby W.F. Stewart factory. Here's a close up of the original location. 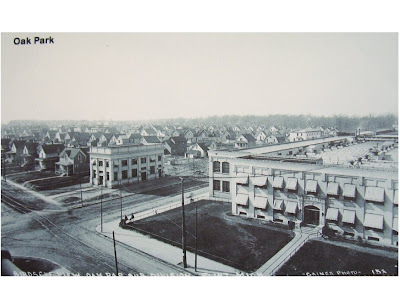 Another shot of the bank at Hamilton and Industrial that includes the surrounding Oak Park neighborhood. 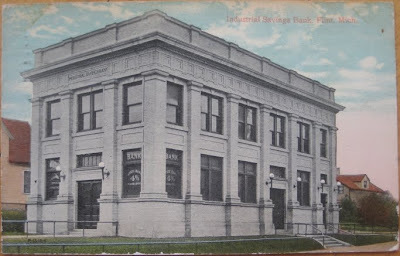 A new bank building was constructed at the corner of North Saginaw and Second Avenue in 1923. It's now the Northbank Center. This 1930 Ariel view of Flint shows the Bank in the upper left corner,across from the Durant Hotel. A more recent shot of the Northbank Center by Sarrazak6881, who has a great collection of Flint photos. I have a vague childhood memory that there was a bank building on the NW corner of Chevrolet and Glenwood that looked something like this. There's still a building there according to satellite photos...interestingly, with a slight parallelogram instead of rectangular footprint...but I haven't been by there in years and don't know whether it's the same structure or something newer. It was unfortunately demolished in 2010 or 2011 along wiht the Saloon nexct to it. It is now an emtpy field maintained by the Kettering University. All of it abandoned now. Both these spots are primarily brick, so I don't think they match. Actually, at 200% it's pretty apparent that the subject building is painted brick, so a currently unpainted brick building could be it. 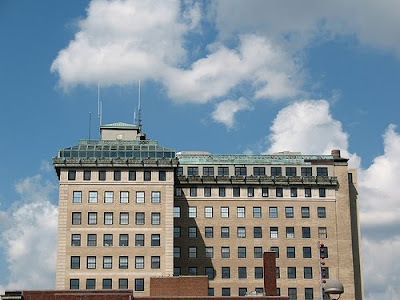 However, the Chevrolet and Glenwood bank building isn't it. The front cornice is different, the front structure is different, and the east face has longer and has eight windows with unequal heights instead of six with equal heights. Lewis and Broadway is closer, but the south-face entrance is in the wrong place and the brickwork is built differently in many ways. I don't think they could be the same. There's a brick ex-bank building with roughly these proportions across Saginaw from the old Fisher plant between Atherton and Hemphill (the recent Luge bar), but it's oriented wrong and the construction details are different. Sorry to disagree guys, but I don't believe this is the bank on Chevrolet at Glenwood. It looks more like a bank that was on the west side of N. Saginaw St. a few blocks north of Hamilton Ave. 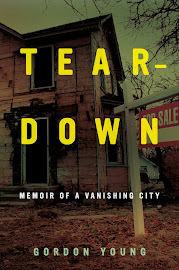 It certainly isn't Chevy and Glenwood. That building is much narrower than this one. What I really like about the photo with the cars in front, is that the first one dose not have it's body installed yet. Back then Buick would test them on the track first and then install the body after it passed the test. This test driver must have needed to do a little banking on his way back to final assembly. The Industrial Savings Bank merged with Union Trust and Savings Bank at the same time embezzlement charges were announce against several employees (unclear which bank). They went ahead and build a new building on the site of the Union Trust & Savings Bank building in months called the Insdustial Union Building, now called the Mott Building. I have a small metal bank that says Industrial Savings Bank Flint, MI on it. It is 2 inches high by 3 1/2 inches wide. Can anyone tell me anything about it? It has a lockon the bottom (I do not have a key!). Your child's coin-bank must have been created no later than the first quarter of 1929, because Industrial Savings Bank and Union Trust and Savings Bank were merged on May 1 of that year. I'd guess that it was an in-bank giveaway to savings account customers, to encourage the savings habit in their children. Hey, I just wanted to know from Gerry Godin where he got those pictures of the bank. Is that a magazine or something? I have a souvenir coin that says 1923 Industrial Savings Bank, Flint Michigan.